Norwich, located at the head of the Thames River, was a center for ship-building; the largest shipping firm in Norwich was Howland & Coit. Vessels traveled down the river and then sailed from New London harbor. Records and Papers of the New London County Historical Society states that 1779–81 were very active years for Connecticut privateers. Yet, as often as British ships were captured, so were those of the privateers. According to the History of Norwich, Connecticut: From its Possession by the Indians, to the Year 1866, “Most of the adventurers from Norwich and New London were captured, imprisoned, and exchanged during the war, and some of them more than once.” One such person was a Captain John Cook, one of the several commanders of the Cromwell; the ship was taken and its crew imprisoned in one of the horrific New York prison ships, where many died. Cook escaped by going overboard and swimming to the shore. A few weeks later, however, he was on a trading voyage aboard the Turn of Times, where he was again captured and carried to Bermuda. Not all private ships were issued Letters of Marque, and therefore, the officers and crew on these particular ships were not providing military or patriotic services. In the latter years of the war, there was a “corrupt, underhand, smuggling trade.” In Norwich, in 1782, an association of sixty-eight men was formed: “Members of the Association Against Illicit Trade.” Since illicit goods were acquired and then sold for cash, the money found its way back to the British instead of aiding American forces. This association supported civil authority, shunned any social or business interactions with anyone involved in illegal trade, and set up a “neighborhood watch” in suspected places of smuggled goods. The association ended soon after the war was over. The website American War of Independence—At Sea includes an alphabetical list of privateers, with links to detailed sourced information. In our R. Stanton Avery Special Collections at NEHGS, we have several manuscripts regarding privateering during the Revolutionary War, including Documents Concerning the Ship Protector 1779–1780; one of the documents is a Letter of Marque issued by the Major Part of the Council of Massachusetts Bay to John Foster Williams, commander of the armed ship Protector, on 8 October 1779. Another document is cosigned by Governor John Hancock. Another manuscript, Esek Hopkins letter, 1777 February 9, to Joseph Olney, is a handwritten letter in which Hopkins, Commander in Chief of Continental Navy, orders Joseph Olney to engage in privateering cruises against British store ships. DAR Genealogy Guidelines, National Society Daughter of the American Revolution, Revised June 2014, 63. Records and Papers of the New London County Historical Society, Part IV (New London, Conn: The Society, 1893), 1: 7–26. Frances Manwaring Caulkins, History of Norwich, Connecticut: From its Possession by the Indians, to the Year 1866 (Chester, Conn: The Pequot Press, 1976), 387–408. 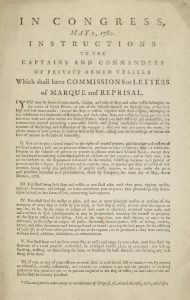 Documents Concerning the Ship Protector 1779-1780, Mss 853, R. Stanton Avery Special Collections, New England Historic Genealogical Society. Esek Hopkins letter, 1777 February 9, to Joseph Olney, Mss C 5904, R. Stanton Avery Special Collections. 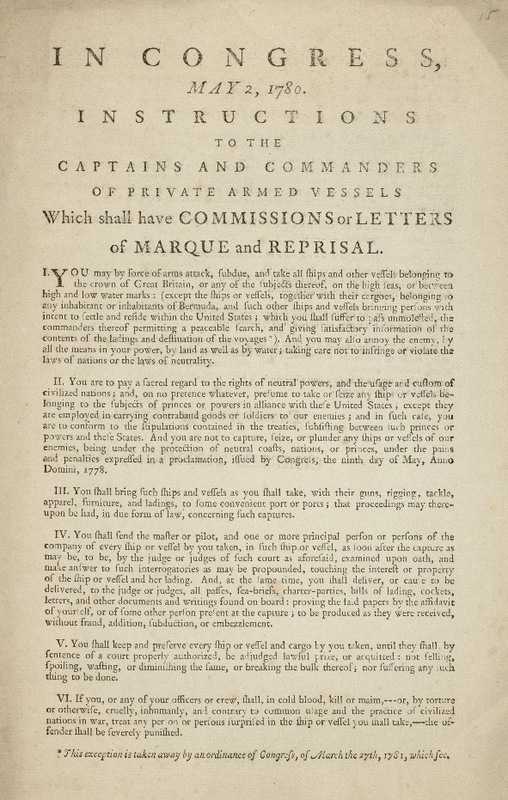 Library of Congress, Rare Book and Special Collections Division, Continental Congress & Constitutional Convention Broadsides Collection http://hdl.loc.gov/loc.rbc/bdsdcc.06401. Caulkins, History of Norwich, Connecticut: From its Possession by the Indians, to the Year 1866, 407. I, too, am researching privateers to prove revolutionary war service of men in the Southern states. Many of these citizen soldiers were “over the mountain” men, back country, regulators, non-Continental militias. Mordecai Sheftall of Savannah, Ga., a prominent privateer was appointed Commissary General for the Continental Armies of South Carolina and Georgia. His records are extensive and contain signatures of Francis Marion, Robert Thornley, Isaac Middlebrook, Edward Telfair, and a host of other soldiers. He sailed to Philadelphia where he received goods and provisions and distributed in Baltimore, MD, Charleston, SC, Savannah, GA, to name a few. “Guide to the Papers of Mordecai Sheftall” at the UGA is a great place to start researching. There are peer-reviewed academic articles on JSTOR. My personal favorite was an older Georgia Historical Quarterly that I stumbled upon in a used bookstore: Greenberg, Mark. “A ‘Haven of Benignity’: Conflict and Cooperation Between Eighteenth Century Savannah Jews,” The Georgia Historical Quarterly, Volume LCCCVI, Winter 2002, Number 4, p544-568. It has been said that an army marches on its stomach and that clue has led me to the privateers’ records and a wealth of information. Your collections probably have a lot of documents related to this subject. The one I originally joined NEHGS to view online was a letter from John Hancock, dated from Philadelphia June 22, 1776 (note the date and location!!) to my 6x great-grandfather, James Athearn. It concerns a couple of privateers, one of which had arrived at Martha’s Vineyard, asking my ancestor to introduce the owners “to your & my Connections” in Massachusetts. It also mentions that Congress was most grateful for the “Specie & Plate” onboard, which the owners “very generously furnish’d.” I’ve been told by a cousin that the reverse side is addressed to “James Athearn, Esq. Commander in Chief in and over the Sons of Liberty in the free County of Dukes County”; is there any way to confirm that, since there is no image of the address side online? There is a privateer in my mother’s family: Nathaniel Harrington, Jr. born 1 Aug 1750/died 1782 in Jamaica, West Indies. He was educated at Harvard and received an A.B. in 1769. According to “Early Generations of the Family of Robert Harrington of Watertown, Massachusetts 1634 and Some of His Descendants” by Frederick Lewis Weis, Th.D., He had been a privateer during the American Revolution. He was captured and sent to prison in England. I have contacted the library and hope to obtain the pages mentioned in the description. This reminds me of the West Wing episode where FLOTUS Bartlett’s DAR status came under fire! Indeed. I was contacted by a woman because an ancestor of hers, Isaac Middlebrook, service record came under question. Scrambling for documentation. It had been a family history and had been accepted years ago by DAR. Of all things, they wanted his marriage license. This is Georgia and marriage licenses are far and few for 1700s. Whether they married or not is rather irrelevant when they had children together and a household. Not everyone had the advantage of a preacher. I have him above a reasonable degree of certainty and closing in on high degree of certainty thanks to his signature in the Mordecai Sheftall accounts. NSDAR used to require proof of *legitimate* descent from the patriot ancestor, meaning applicants needed to prove the parents of every person named in their lineage were legally married to each other when that person was born. I thought they’d finally come to believe Patriot blood was thicker than the ink on a marriage license and amended the eligibility requirement with respect to out of wedlock births, provided the child’s actual parentage could be proven. As a rhetorician, I would suggest that the DAR expand their understanding of the “proofs of legitimate descent”. I would not suggest that it would be interpreted as a lowering of the bar of their standards, but an acknowledgement that out-of-wedlock births did occur, that records have been destroyed or lost, or that back country settlers—who turned the tide of the war—rarely had easy access to a preacher or justice of the peace. For so many years, marriages were verbal agreements in front of family witnesses, if possible. Otherwise, they took up living as man and wife (common law marriage). I have ancestors who are listed as “seamen”‘ “Capt.” And “traders” one person may show these trades, it depends on which records I am viewing….could they perhaps have been privateers? This would be the fun part. I’d say it’s possible until proven otherwise. This is where critical analysis becomes your best friend and another set of eyes perhaps. It’s like saying someone was a “capt” in the RW. First, you have to figure out if they were Continental or Militia. I’d try to find the name of the ship and research it. Until I came upon the Sheftall files, I was combing period newspapers for any clues. I’d be glad to help narrow the field for you, because I’m in the records myself. Having read this I was anxious to look at the website, American War of Independence – At Sea, cited in the article for the name of an ancestor. However, when I googled the title, all I got was a group of images – no listing of names as stated in your article. Please clarify.